Communities on social media are an emerging phenomenon in today’s society. Within the framework of networks, people come together virtually, satisfying their needs of communication and belonging, usually by creating communities based on mutual interests. Often, these communities follow new rules, by using graphic images more than words, enhancing communication for the sake of communication over content. The social media applications that interest us for the purpose of this research are Snapchat and Instagram and the point where these platforms meet through ‘Snapchat Fams’. Snapchat is both a messaging platform and a social network, with as main characteristic its ephemeral nature, since the main content, named ‘My Story’ that is a series of videos or photos of the user, has an expiration date of 24 hours (Moreau n.p.). On the other hand, Instagram is based primarily on uploaded photographs on user profiles, predominantly via smartphone (Moreau n.p.). The so-called ‘Snapchat Fam’ is a tactic used by social media influencers to redirect their followers to another platform. Through the use of Snapchat influencers encourage their followers to leave a specific emoji as a comment to their Instagram post. Emojis are the evolution of emoticons, which are shorthand for facial expressions and are used to embellish text-based communication with the user’s emotions (Novak et al. n.p). Emojis are graphic symbols, or colorful pictorial images of emoticons, that take a step further and not only widen the variety of emotions that a user may express (Kaye et al. 464), but can also communicate concepts and ideas such as time, the weather or even subtle meanings (Novak et al. n.p). The use of emojis and emoticons has become a vital part of online communications, especially among younger users who have developed their own code and interpretations. We aim to showcase how the use of emojis within the phenomenon of a ‘Snapchat Fam’ can be seen as a particular cross-platform expression of a subculture that is subsequently commodified by the influencer. To analyze the phenomenon of ‘Snapchat fams’ as a subculture, we used three different case studies and gathered data through the form of screenshots. 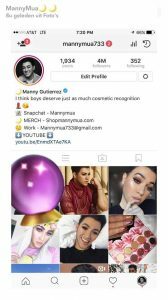 We used empirical analysis on the different platforms of Snapchat and Instagram, and we focus particularly in the communities created by NikkieTutorials, Manny Mua and LauraLee, three influencers with similar content. By following their Snapchat account, we aim to collect data from any activity related to the creation of ‘Snapchat Fams’. In addition, the screenshots will be textualized and studied in order to conclude in results about the response they had. We chose these three influencers as they are involved in the beauty and cosmetics industry, which is a billion dollar industry (Sorvino n.p.). As it is considered an industry that has a forceful marketing presence and is very competitive, we thought it was appropriate to study the means that influencers use to remain relevant. Lastly, we take notice of the emojis and follow the thread between platforms to examine whether emojis can be seen as an expression of subcultures. In our results, we hope to unveil the commodification of subcultures by micro-celebrities through the use of emojis and provide the necessary tools that help us understand Snaps and Instagram posts as data. Within this paper the social media influencer is seen as a micro-celebrity phenomenon. The micro-celebrity is a practice that views the audience as a fan base, and maintains popularity by managing fans (Marwick and boyd 140). Furthermore, the practice manages and constructs the presentation of the self with the consumption of this image by others in mind (140). Marwick argues that the micro-celebrity is seen as a very specific type of visual self-presentation strategy that is related to the online attention economy: here more clicks and views mean more success and status for the micro-celebrity (138). These two conceptions combined are used within this paper: the micro-celebrity practice thus contains (visual) self-presentation techniques endemic in social media that are used to construct and maintain an image for fans to consume. 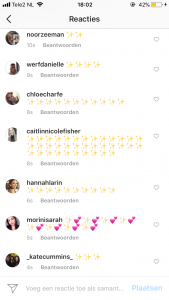 This is especially relevant regarding the ‘Snapchat Fam’ practice, here emojis are used in a way that allows the influencer to reach out to followers and simultaneously improve their online attention and status. Phatic communication considers how interaction on digital platforms favours ‘connection over content’ (Miller 397). Phatic information concerns the process of letting others know that ‘one is still there’, by the use of media (393). Phatic communication can in this sense be seen as the means of constructing a ‘connected presence’ (Jerslev and Mortensen 253). The connected presence of users on platforms weighs heavily on their limited availability and attention. Within this line of thought, one needs to sustain their mediated sociability to maintain their connected presence on a particular platform. One could argue that the role of phatic communication is vital to ones connected presence, as keeping in touch may be more important than the actual information that is transferred (Licoppe and Smoreda 321). ent to the subculture (Ems and Gonzales 1751). These beliefs and practices are important, because the condition to participate within a subculture is that one is familiarized with the beliefs and practices that are fundamental to the subculture (Bilgrei 5). Consequently, subcultures allow for their participants to feel like they belong to a particular group that shares the same beliefs and traditions which differs from the people who do not belong to the subculture: “individuals within such categorical communities have at their disposal common categorization systems to differentiate between insiders and outsiders and common vocabularies and symbols through which they create a shared identity” (Lamont and Molnar 182). ables is the engagement with a post or profile. The increased interactivity and attention around their post increases the online status of the micro-celebrity, which allows the micro-celebrity to stay relevant. The ‘Snapchat Fam’ consists of fans of particular influencers that feel compelled to leave emojis on posts when the influencer asks them to. We argue that the Snapchat family can be seen as having characteristics that resemble those of the subculture. In the case of the Snaphat family this subculture surrounds a particular subject: the influencer and more specifically in the case of NikkieTutorials, Manny Mua and Laura Lee the community surrounds the subject of makeup. Another characteristic that the ‘Snapchat fam’ shares with those of the subculture is the fact that the participants of the subculture are joint by social rituals: in this case the participants of the ‘Snapchat Fam’ use symbolic artifacts, emojis, to express their support for the influencer. The difference however with the traditional subculture is that the ‘Snapchat fam’ has a more temporal nature, one needs to continuously leave emojis when the influencer asks to remain part of the community. 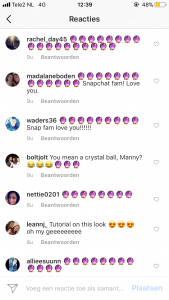 The ‘Snapchat Fam’ thus surrounds new Instagram posts, and the construction of the ‘Snapchat Fam’ constantly shifts from one post to the other. The purpose of the ‘Snapchat Fam’ is thus twofold: on the one hand it could help the micro-celebrity to increase their attention and status, on the other hand they allow for their fans to feel connected to them. This subculture only consists of the fans that follow the influencer on multiple channels and react with emojis at the influencer’s request. One could easily become part of this subculture, because the low-threshold use of emojis, seeing as emojis are easy to use and universal in nature. 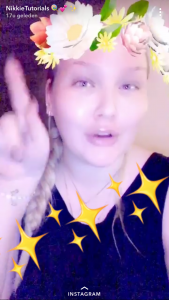 Influencers such as NikkieTutorials, Manny Mua and LauraLee attempt to steer the interaction with their followers from Snapchat to their Instagram profiles. The cross-platform engagement through the use of emojis could be seen as a marketing tactic to inflate the engagement with their followers on Instagram. The micro-celebrities are successful in steering the behavior of their followers, because the emojis serve as a universal language that is interoperable: they can be used on multiple platforms and by followers who do not speak the same language. This characteristic of the emojis is vital for the construction of a ‘Snapchat Fam’, because if the emojis were not interoperable and their use was tied to a particular platform or language, the ‘Snapchat Fam’ could not be constructed as it is now. We argue that the use of emojis here can be seen as a form of phatic communication, where connection is prioritized over the content of the message. While the emojis still convey meaning, in this case the emojis are specifically used as a way to participate within the subculture. When one thus comments with a particular emoji, one signifies identification with beliefs and practices of the ‘Snapchat Fam’. Because of the temporary nature of the ‘Snapchat Fam’ as a subculture, the feeling of being connected with the ‘Snapchat Fam’ is also temporal: the participation within the subculture includes the shift of the expression from one Instagram post to another. In this case this means that users constantly need to keep up by leaving emojis when the influencer asks them to, in order to remain a part of the ‘Snapchat Fam’. As a result, fans keep coming back, which is beneficial for the influencer and their status. We argue that the increase of engagement through the reactions containing emojis on the posts of the micro-celebrity is beneficial for their status, as aforementioned the conditions on which they base their success is the amount of likes, views and comments they receive on a particular post. The creation of the subculture here is in a way commodified by the influencer, considering that the expression of this subculture benefits them and their practice. Through using empirical platform-based research and theoretical analysis, we have carried out an effective investigation into the use of emojis within social media-based subcultures, particularly the ‘Snapchat Fam’. We have discovered that social media influencers have developed their use of emojis to create a cross-platform form of expression that not only encourages follower engagement, but also helps garner a sense of community amongst their followers. It is evident, both through our research and analysis, that emojis have grown within these communities from simple icons, to visual prompts of belonging that followers can adopt. Further, the purpose of influencer emoji use can be traced to an influencer’s commodification of their followers. It is a simple, yet effective, way of increasing engagement and interaction on the influencers page, and thus makes them a more attractive prospect for potential sponsors or marketers. In the example of beauty influencers, cosmetics manufacturers would find great benefit in working with an influencer who can give tutorials of their products to an active, interactive community. To conclude, it is apparent that emoji use within virtual communities and subcultures such as the ‘Snapchat Fam’, has allowed these groups to develop into revenue-generating online communities. Through using emojis as a cross-platform identification tool, influencers have showcased the versatility of the emoji, and the monetary worth of online followings. Bilgrei, Ola. “Broscience: Creating Trust in Online Drug Communities.” New Media & Society, (2017): 1-16. <http://journals.sagepub.com/doi/full/10.1177/1461444817730331>. Ems, Lindsay, and Amy L. Gonzales. “Subculture-centered public health communication: A social media strategy.” New Media & Society, 18.8 (2016): 1750-1767. Gelder, Ken. The Subcultures Reader. London: Routledge, 2005. Jerslev, Anne, and Mette Mortensen. “What Is the Self in the Celebrity Selfie? Celebrification, Phatic Communication and Performativity.” Celebrity Studies (2015): 1-15. Lamont M, and Molnár V. ‘The study of boundaries in the social sciences.’ Annual Review of Sociology, 28 (2002): 167–195. Licoppe, C. and Smoreda, Z. ‘Are Social Networks Technologically Embedded?’ Social Networks, 27.4 (2005): 317–35. Marwick, Alice E., and danah boyd. “To see and be seen: Celebrity practice on Twitter.” Convergence: The International Journal of Research into New Media Technologies, 17.2 (2011): 139-158. Marwick, Alice E. Instafame: Luxury selfies in the attention economy. Public Culture, 27.1 (2015): 137-160. Miller, V. ‘New media, networking and phatic culture.’ Convergence, 14.4 (2008): 387–400. Novak, Petra Kralj, et al. “Sentiment of Emojis.” PLOS ONE, vol. 10.12 (2015): 1-22. Our Future Will Last Up To Ten Seconds: Could Snapchat be used as a revolutionary tool?